The Realistic Mummy: Pssst! Want Some KD? Kraft Dinner, beyond the dorm? I fed my children Kraft Dinner tonight, in all its obscenely orange glory. But, before I self-flagellate too much, it must be noted that good ol' KD has evolved! 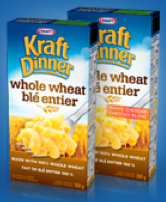 It is now possible to buy KD in a whole wheat pasta version (with orange or white cheese powder) and also in three versions that Kraft is labelling "Smart," meaning with vegetable, extra fibre or omega-3 content in the noodles. Gasp! Of course, the stuff is still very high in sodium and the added benefits are passable in terms of quantity. For example, the KD Smart vegetable variation gives half a serving of vegetable per 3/4 cup of prepared pasta, and I can't see a child eating more than 3/4 of a cup, so we're still at least 4 1/2 servings away from the recommended number of 5-6 servings daily of vegetables/fruit. In other words, KD Smart or KD whole wheat have at least some nutritional value, but they in no way let me off the hook regarding serving vegetables or other whole foods.